Ballymena United Allstars Ladies Football Club have won the NI Women’s Football Association Championship 2016, securing an immediate return to the Danske Women’s Premiership. The Sky Blues won the title with two games to spare in a thrilling 3-1 victory over their nearest rivals Lisburn Ladies at the Michelin Athletic Club. Needing a draw or better to secure the title, Ballymena conceded an early goal and Lisburn worked tirelessly to stop the league leaders building any momentum, closing the ball down quickly and putting pressure on every pass. 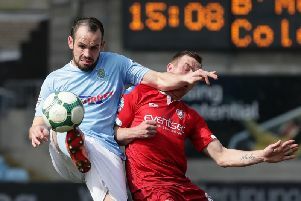 In the second half, Ballymena came out fighting, determined to win the Championship in front of their home crowd on their last match in the town this season. With better pace and more precision, the Allstars began to create more chances and eventually broke through when Danielle Winter forced the ball home from close range. The goal freed Ballymena and they grew in confidence throughout the rest of the game, with Rebecca Boyce and team vice-captain Michelle McDonald both finding the net with fine strikes in the last 15 minutes to complete the victory and a remarkable season for the Allstars. Joint Managers Trevor Boyce and Mark Carlisle were delighted with the result. Boyce said: “This is a fantastic achievement by the team. They have worked hard all season in an extremely competitive league, showing passion and determination to come out on top every time. Team vice-captain Michelle McDonald said: “We are over the moon to have won the Championship with two games to spare and to go straight back into the Danske Women’s Premiership. “We knew tonight would be a massive challenge but we never gave up and knew we could do it. “The whole team – players and coaching staff alike – have stuck together and put in the hard work and we are delighted that it has paid off”. The Allstars will face Lisburn Ladies again on Friday September 2 at Seaview in the final of the Championship Cup and their focus will now be on securing the League and Cup double.